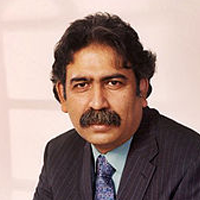 Mansoor Afaq is an Urdu poet, playwright, column writer and religious writer from Pakistan. He has written many famous books and tele-serials. Mansoor Afaq is an Urdu poet, playwright, column writer and religious writer from Pakistan. Five famous books authored by him are; Chahra Numa (Urdu Articles), Afaq Numa (Urdu Poetry), Saraiki Grammer, Mein Wo Aur Ata ul Haq Qasmi and Gul Pasha. He wrote the following seven Urdu drama serials: Nimaksar, Zameen, Pani Par Bunyad, Pathar, Soya Hua Shehar, Dunya, Dhan Koat (Urdu Drama serial).